The Wizard of Oz is one of the best classical movies of all time; a story rich with symbolism, and carries with it all the elements of battle between good and evil. Dorothy yearns for a new life. A place beyond the rainbow where she will be free from worries; a beautiful land where dreams come true. Fantasy, make-believe, we all yearn to go somewhere away from the stresses of life. 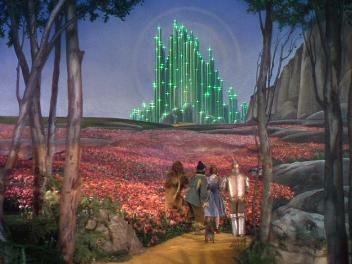 A tornado blew into her little town and transported her to the Land of Oz. Similar to real-life, tragedies (tornadoes) sweep into our lives. Instantly we are carried into an unknown world of events we didn’t expect. Wanting to go back to the way it was we try feverishly to return to our safety net; a place we call “home.” With uncertainty and aggression we venture out hoping somewhere, someone, will be able to help us find our way back. Looking for wisdom, we courageously seek what is true in our hearts. Deep inside each of us, we hunger for love. Sometimes feeling like an empty tin man, we seek out what we expect to fulfill our desires. Bravery is not our forte, we don’t like to take risks but if someone comes along to stand beside us, we have the courage to open up new possibilities. It’s a no-brainer to describe wisdom as an all-knowing peace which purposely draws us closer to who we are meant to be. It is our mere existence in this vast world to gain a knowledge that is unknown to man. Seek first the kingdom and all these things will be given to you as well. (Matt 6:33) Finding heart knowledge is gaining a perspective on the situation. Taking life as it comes will get you nowhere. It is necessary to take some risks. The journey is uncertain; there will be elements of doubt and fear, but having faith and courage will bring you home safely. Just be sure to pick up some of the apples that are thrown your way; you might need the nourishment. I absolutely adore the wizard of oz and the message it brings. Thanks for this post! Love the pic too! This makes me reflect back on my life. when I could have said NO and move into the direction that I want. and as you have said faith and courage will bring me home safely. Thanks for the challenge and reassurance at the same time!